A contactless ballistiocardiography-based sleep tracker with advanced metrics including heart rate variability (HRV) to measure athletic performance and recovery. Similar to the Beddit Smart, Emfit QS uses a technique known as ballistocardiography, with its bio-sensors housed in a thin strip which you place under your mattress or mattress topper. Sleep tracking is completely autonomous; just lie down on the bed and the device will start recording your body metrics. 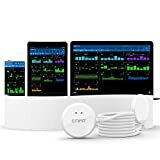 Emfit QS is currently the only sleep tracking solution to offer a comprehensive way of monitoring an important biomarker known as heart-rate variability or HRV. In recent years, HRV has gained recognition not only as a general indicator of good health, but also as a metric that athletes can use to track performance and monitor recovery.